The first is unique because of a very special and truly unique item. Now, I would love anything from this shop. I have to say, it was nearly impossible to pick just a few pieces from The Splendid Lily to showcase here, because every single item in this shop is so, so pretty! The overall look is a mix of boho-inspired, with a modern and feminine touch. 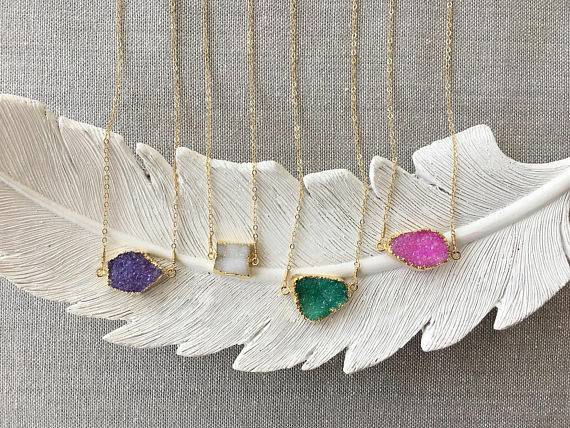 These Druzy Gemstone Pendant Necklaces for example, are a safe bet for any woman who likes jewelry, and they come in several different colors. But for something truly unique, these Morse Code Necklace and Bracelets can be customized with words like "I Love You" or anything you choose, perhaps your wedding date or a sentimental nickname. Order anytime between now and January 12th and use the code "SPLENDID10" for 10% off! Another classic gift that is perfect for any occasion is a beautiful scented candle. 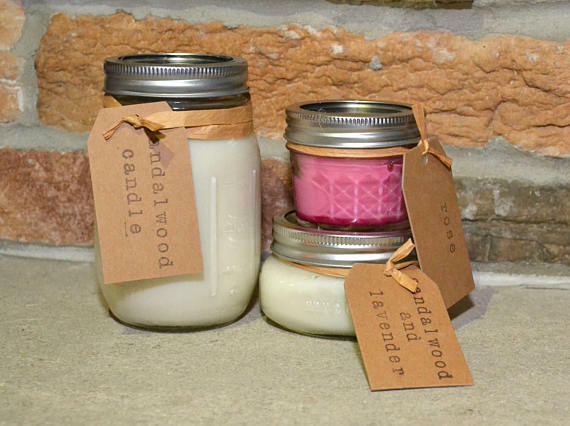 The hand-poured soy candles at Sophie's Scents come in three different size glass jars and over 20 different scents. Available scents range from luxurious ones like Sandalwood & Lavender, to yummy culinary-inspired scents like Caramel Latte and Spice Cake. Of course if this is in fact for a Valentine's Day gift, I'd suggest pairing it with something else, like a massage gift card, for example. Alex, the owner of Sohie's Scents, is a passionate animal lover and the owner of Sophie, her rescue dog. "Sophie was rescued in the summer of 2014. She’s now 5 and is living a life full of naps, treats and belly rubs!" In honor of her rescue dog, $.50 from each candle purchased will be donated to Safe Haven Dog Rescue in Elburn, Illinois. The candles at Sophie's Scents extremely affordable, with the largest candles priced at just $12.50, and the two smaller sizes both under $10. I'd get one for a gift and splurge on a few for myself! Shop Sophie's Scents here >. For the truly romantic, anything with a romantic word or saying is much appreciated. Simply Quotables has wide range of products; including drinkware, tees, stationary, and printables. For a sweet gift, they've got you covered with their romantic and fun prints. 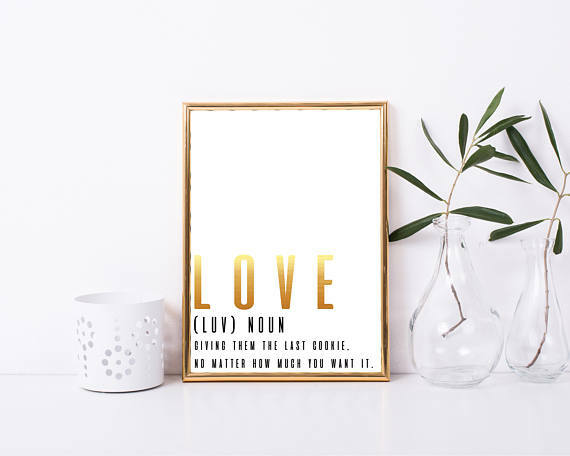 If you need a last-minute gift, this Love Definition printable is perfect. For something a little more substantial, make a Custom Quote Print, which can be ordered with a frame as well. 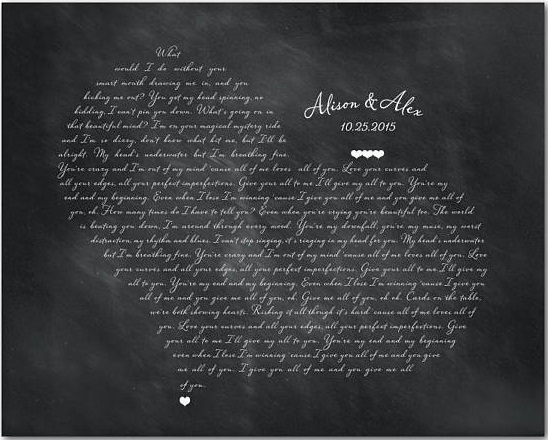 Customize it for your special someone with anything from your song, a romantic quote, or poem. Simply Quotables is having a Valentine's Day sale for 15% off all purchases of $10 or more! Relaxing bath products are always a welcome gift. 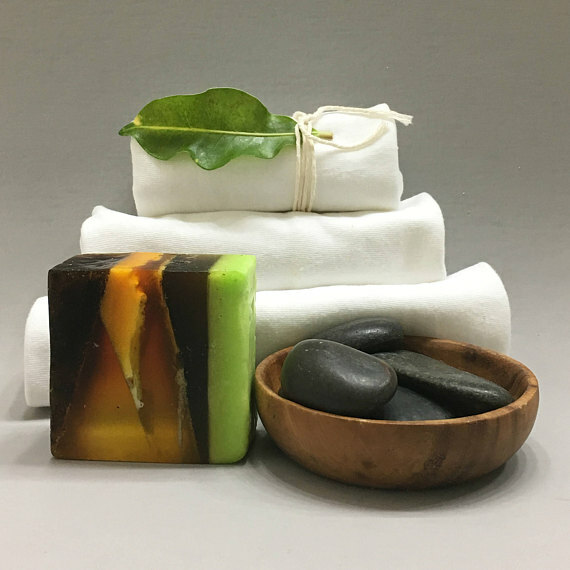 At My Essential Elements you'll find natural bath and body products, including skincare and sleek accessories; like wooden bath trays and cotton spa towels. The 6-Piece Valentine's Day Gift Set incorporates bath and body products as well as a cute Valentine's themed wall hanging. The set includes an Aloe Zing Bar, Spa Facial Towel, relaxing epsom salts, a mineral mud mask, and a decorative "LOVE" Valentine's Day sign in red or white. And while of course I don't recommend anti-aging products as a gift, The Active Eye Cream & Mineral Facial Serum at My Essential Elements will both will be marked down for Jan 6-7 only, for $21.99 each, so you may want to stock up on a few of those for yourself! For an extremely romantic and personalized gift, you can't go wrong with something from Susan Newberry Designs. Susan creates beautiful custom wedding prints and canvas wall art that is perfect for a wedding, anniversary, or Valentine's Day gift. My favorite is the Customized Song Lyric Wall Art. Whenever I finally get all of the photos from my wedding framed and hung, I'd love to arrange them with different quotes here and there. This custom print with our wedding song would be perfect. You can pick from multiple backgrounds and frames, or upgrade to canvas. For a 10% coupon code, join the Susan Newberry Design mailing list. Any of these unique gifts are sure to make anyone happy. Let me know in the comments below which one is your favorite! Thanks!! Definitely...bath products are always a treat! 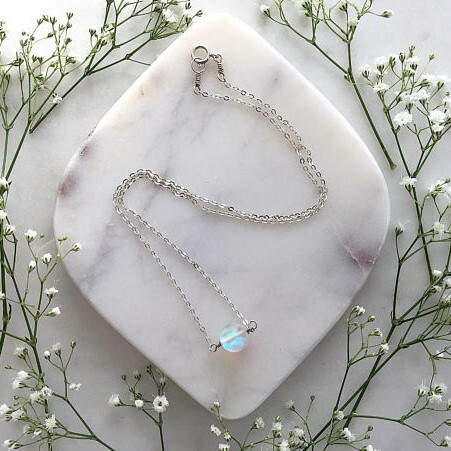 Druzy Gemstone Pendant Necklaces are sooo pretty! Love the colors. Great find dear. Isn't it? I just love that kind of jewelry! Her shop is full of so many pretty pieces! !